Every child is born with creative potential, and most parents enjoy encouraging and nurturing these talents! Not all children are destined for art college or chart success, but children love to play with creative toys and explore their ability to make and create things. Children and Creativity – Start Them Early! If you want to encourage a creative mind, you need to make sure that creative toys are always around for your children to play with, no matter how old the children are. Some of the basic creative toys and games are obvious - books, art and craft materials, musical toys to make noises with, clay, and role play toys. From a young age, children’s toys should be unstructured and easy to play with. Give little ones the option to use their toys in as many ways as they choose, by giving them creative toys that can become a variety of things. Let them daydream and have imaginary friends, it’s normal and part of growing up. Role play toys can help nurture this budding imagination. Creative toys at an early age help to bring a child’s natural curiosity to the surface and help them explore and find things out for themselves – how to make a mess, a noise and strangely shaped objects out of plasticine being a few! Creative Toys for Older Children. As a child’s hand coordination increases, so does their interest in making things. Older children love craft kits, construction sets and difficult puzzles which stimulate problem solving abilities and help teach patience. 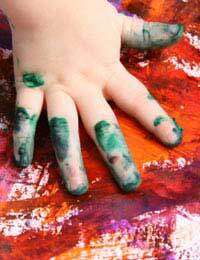 Older children like to take on longer term creative projects and love to paint, sew and cook. They will be learning to read and write at this age so creative toys will help them in the classroom too. Don’t overcrowd children with too many pre-planned or organised craft activities in an attempt to try and force their creativity. Give them time to decide what they want to do and where there interests and talents lie – if they show an interest in music this can be encouraged with musical toys and eventually an instrument as they get older – but giving a child a violin in the hope that they will become the next Vanessa Mae style musical prodigy will be counter-productive. Colouring books are great for stress relief as well as hand eye coordination, especially in younger children. Give them a set of pens and a selection of colouring books and watch them concentrate for hours! Make a Puzzle - This appeals to children’s desires to make things for themselves as well as the puzzle solving abilities. Most toy and craft shops sell blank cardboard puzzles, or you can choose a child’s favourite photograph and have something made up to order from a digital image. Kids can draw a picture on the blank cardboard, take it apart, and put it back together again – or use the blank puzzle sets to make gifts for friends and family. Writing stories - Give your child creative prompts, either that you make up yourself or from books or online. Encourage them to make up abstract stories from a set of words...and then let them come up with their own free flowing stories. Making Sweet Music – Why Musical Toys are Great for Kids. There are many reasons that children need music in their lives! Being musical and making music (or just noise) helps children to develop confidence in expressing themselves – they can learn to show their feelings through singing a song. Music also helps children learn to cooperate, follow directions, and develop social skills. Choose durable musical toys for younger children, and don’t give them anything too complicated. As they get older, introduce them to different types of music – a child’s MP3 player, basic instruments and taking them to see live music of different types. Encourage singing and dancing too, as this helps to improve a child’s confidence...even if they are never going to be the next Mariah Carey!